Steven sold his guitar (he plays piano now), and took the money to the RAMs 2001 auction in November. He fell in love with this Great Planes Easy Sport and talked the owner into selling it to him instead of auctioning it off. That used up his money. He had to wait until Christmas for the O.S. FX-46 motor. Starting on December 26th, he installed the radio system, servos, wheels, and motor himself. 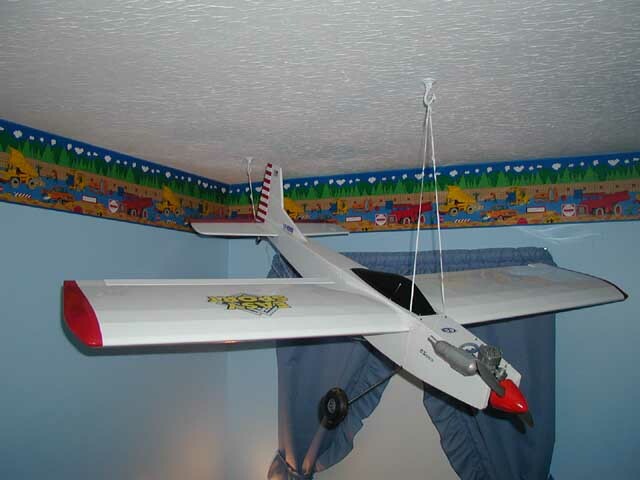 Here is the finished plane hanging in his room. 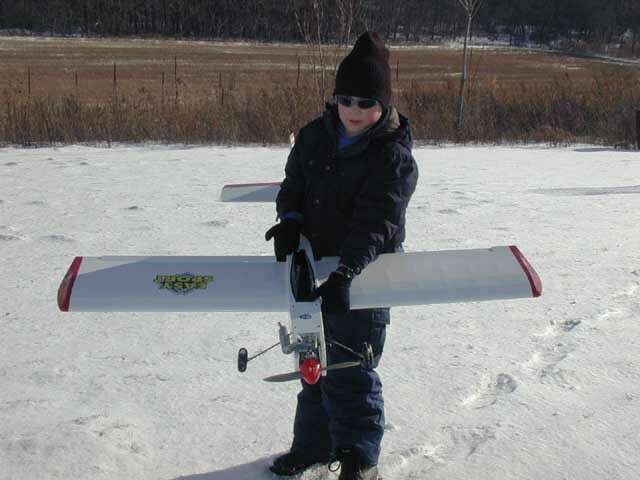 Here he is at the RAMs annual "Freeze-In" on January 1st 2002; taking it to the flight line for its maiden flight. The snow wasn't deep enough to keep it from taking off. The day was quite windy...15 to 25 mph. He was quite nervous, but very anxious to fly it. I helped with the take off and landing. This shot was taken during its first flight. After one, he was satisfied and decided not to fly again that day. 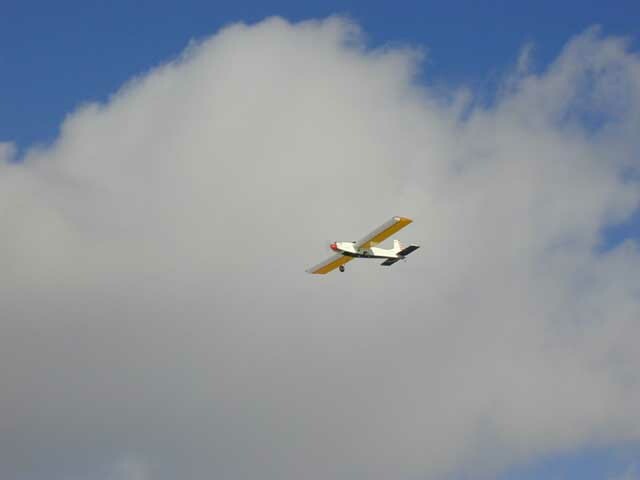 Later in January he did one more assisted flight, and then three solo flights. He still loves it. By the way, his three landings were better than my two. This shot was in the cabin on New Years day after its first flight. 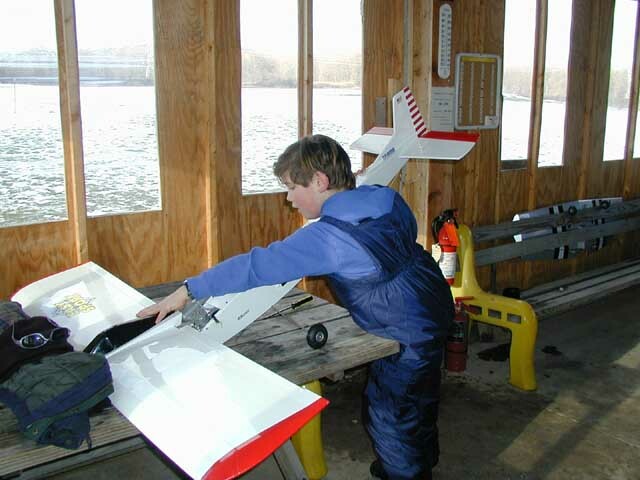 Steven flew this plane all year (2002), and has literally hundreds of take off and landings on it. He has flown the snot out of this plane. Aside from a couple of props, it has need no repairs.